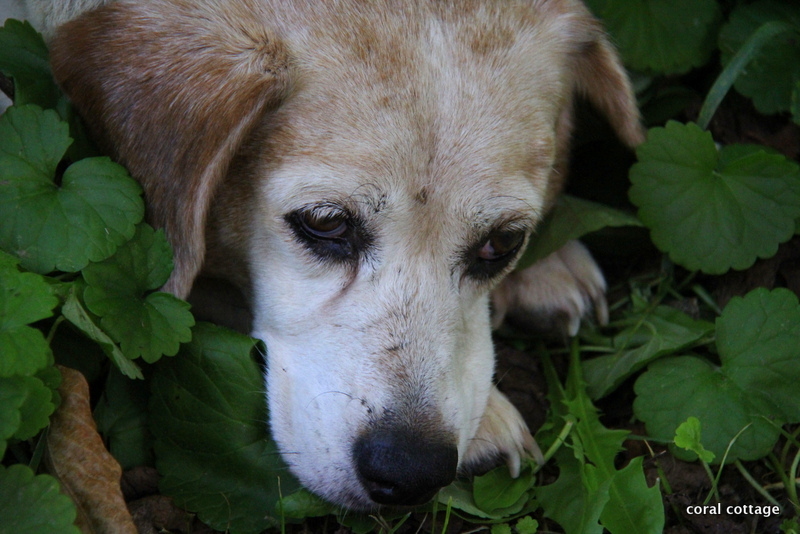 A no good for nothing beagle hunting dog lost from her pack. She adopted us one hunting season. That was at least 15 years ago, when she decided she had enough of all that running, shooting, and mistreatment by the humans. She was a few years old at that time. We guess her age now to be around 18 years. It was not love at first sight, or for many years on our part. We didn’t need, or want to take on any more animals. We had our hands full with at least 20 cats and about 10 dogs at that time. She was trouble from day one. She has caused more problems with the other pack of rescue dogs we had. All the others got along fine, no squabbles or arguments. She fought the others for control over the food, and bedding, and human attention. I couldn’t forgive her for chasing the cats, and then a horrible incident occurred and she killed one of them. She repeatedly sent our other dogs for vet care after vicious attacks. She made us so angry and there were many times when my patience had run the course and I said that is it – she is out of here. Visitors to the house would always question us. She seems so sweet, how can you say she is a bad dog? 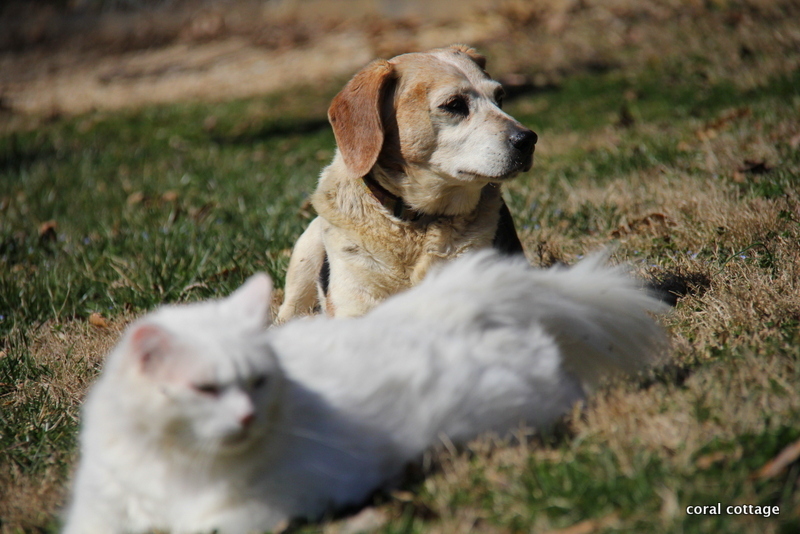 The years have mellowed her aggressive behavior, she has come to learn that the cats rule the roost around here. Now she watches over them. She is what we call a recreational barker. She never chases or barks at the deer when they eat the garden. She never barked at the bear that tore up the bird feeders, the coyote that wandered around the property, or the raccoon that figured out how to get in the house this summer. She doesn’t chase or bark at anything, except chickens. This spring when the renters moved away from the farm across from us, they left their chickens. Don’t even get me started on how mad that made me. I’ve been wanting chickens for a long time. I decided I would make lemonade out of the situation and I would adopt those left chickens, and have several free chickens and a rooster. It took weeks of plying them with goodies to cross the fields and the road and come over to our property. Nothing doing, that dang Betsy! Eventually they were dispatched by coyote or bear. I try not to think about it. We used to swear up and down she would out live all our other “good” dogs. Now her age has crept up on her. She can’t see that well, and her hearing isn’t so good either. She has been asking for permission to become an indoor dog. We don’t want an indoor dog. The temperatures are low here these next few days and are going to dip to beyond brutal. We have been worrying about her being out in the cold. This morning, before dawn I awoke and came down stairs. A quick check on the temperature – 15 degrees. Her dog house has cedar shavings, pillows and blankets and I have covered the opening with plastic to knock down the wind. It was suggested we purchase a heated blanket for her. I grabbed an old comforter and placed it on the floor in front of the TV. I opened the front door went over to her dog house and told her to come on. Up and out of the dog house and straight to the front door. She knew she was being invited inside. TAA DAA Betsy made it inside. We purchased a new dog bed for her today. It has been placed upstairs next to the humans bed, where she will sleep at night. Life is going to be different around here. The old country dog has moved in. P.S. 4:00 am – old country dogs have weak bladders. 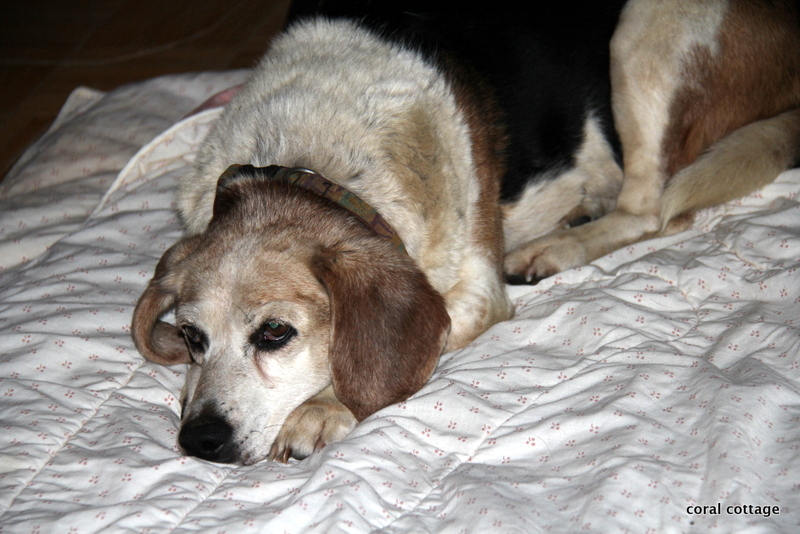 Kim of Red Dirt Farm • This entry was posted in Country living and tagged beagle dog, betsy beagle, happy story, indoor dog, moving on up, rescue dog. Bookmark the permalink. Bless Betsy’s little heart AND yours. Bless was not even remotely the word that was used this morning at 4:00am when I had to take her outside and she thought I was trying to kill her. This isn’t going to be easy – I can see that now. 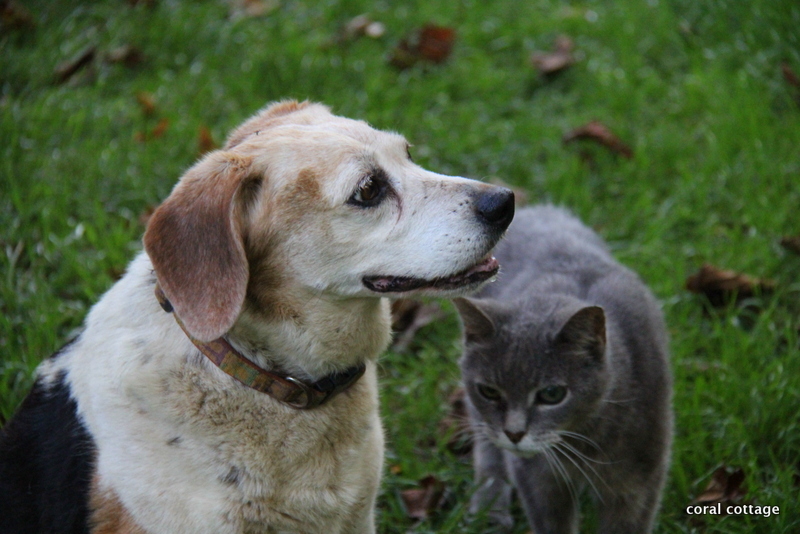 I am commending you for taking such good care of an old country dog. I viewed the you tube clip. Was that funny noise her barking? This was a heartwarming post. Enjoyed it muchly. I have an aggressive cat that adopted me. Won’t let the FIRST cat that adopted me anywhere near the porch so he lives down at Poppie’s now. Yes, that funny sound was her barking – not her normal bark that keeps me awake at night. This is the special chicken bark. Go figure what that is all about. I wanted so many times to find another home – or Poppies place to put her. Yet here she is. She acts like we are trying to kill her, when we try to get her to go out for bathroom breaks, and it was not amusing this morning at 4 in the snow and cold. Such a sweet story! Soon she will be in bed sleeping with you. Even with a king size bed it gets crowded! Hi Eleanor – so good to hear from you. I already have a full bed of cat, I don’t think the dog would go over too well, although the cats are handling her being in the house in general better than I thought they would. Happy New Year to you! 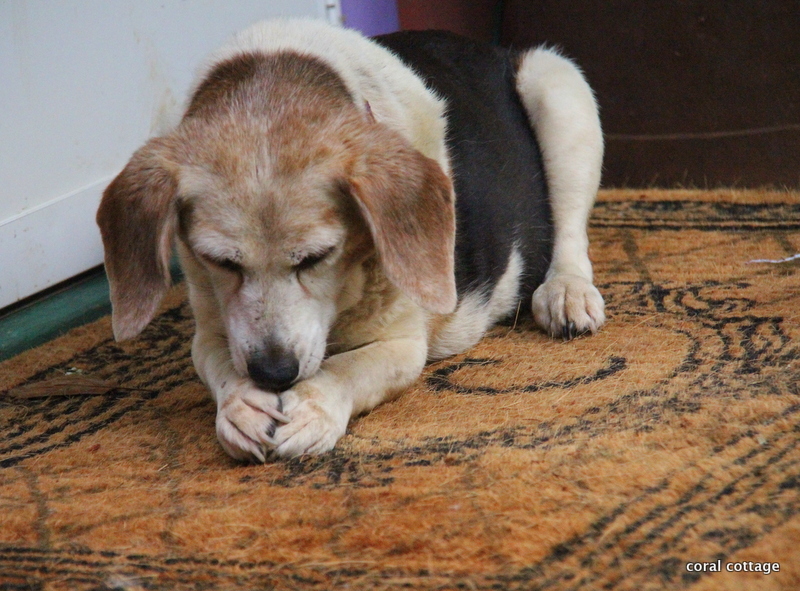 AWWWWE, Betsy is so cute praying to her angels to become a house dog! I would have been worried about her also. Dem Ole Bones—- It’s amazing she gets around so well at her age. Hank is to noisy, so our bedroom door is shut at night or I wouldn’t get any sleep! I like the praying photo too. Betsy is having a lot of trouble with the steps, she has fallen on the porch steps several times, I think it is a combo of her poor eyesight and she has leg hip issues. The stairs in the house are too slick for her. Charles had to carry her up the first night, of course she acted like he was trying to kill her. There are some real issues that we have to work out. But she is happy house dog for now. Good seeing you too. I’m heading in later for my miracle injection. Love your storytelling on the farm! We had a dog and 2 cats before having our babies…When the last fur baby (Pumpkin, the cat) passed away several years ago, I was in no hurry to invite more pets into our home with our 2 little ones running around, but low and behold, a wandering cat adopted us 6 months later…She is the most loving, tolerant cat we’ve ever had! Ah, thanks for your comment. Bringing animals into the house adds so many issues, although I personally think cats are a lot easier than dogs. Betsy has done pretty good so far considering her humble outdoor existence. I’m happy a new cat found you and she has made herself a part of your loving family. 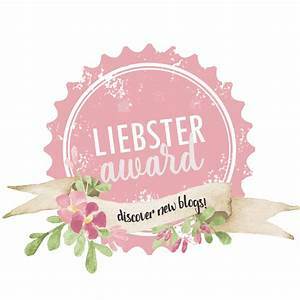 Oh my goodness – I love this story! I was secretly hoping she would make it in the house as I read the story and cheered when she did. 🙂 Yes indeed, things will be a bit different around there…… Happy New Year!! Staci – two nights, and I am exhausted it is like (although I never had human babies) getting up every few hours to feed the baby. She paces, needs to go out, isn’t sure what we are trying to tell her, and or if we are trying to kill her. She is suspicious of everything we are trying to teach her. She can’t make it up the steps to bed, so Charles had to carry her and she acted like he was killing her. So funny, it will all work out in the end. Happy New Year to you. Looking forward to reading all your new ventures. Old Country dog adjusting to indoor life, but pushing the envelope a little each day. Got to sleep last night all night – yeah! She is unique all right – barking at chickens, good grief. She looks so happy now she is inside! I have to tell you I just watched your video of her barking at chickens and my Ruby has been running around barking and looking for the mystery dog! Awwww, Kim….this was a wonderful post-I guess you have learned patience form this rascal-and I guess her prayers were answered! Such a sweet looking hound-but I know looks can be deceptive! Good luck keeping her off your bed!!! She does look angelic, occasionally the horns hold up the halo. I drawl the line with the bed though. It is full with cat and me.